Casa Kestos Estate in Sayulita is situated on 10 acres of lush jungle leading up to the beach on the north end of Sayulita. This private beachfront estate has 3 villas, a 2 bedroom Main House with Pool, and an additional 1 bedroom Bungalow and 1 bedroom Casita. The villas can be rented separately if you need less room. Please note if the bungalow and casita are rented individually, they do not have access to the pool. The beach is just steps away. Casa Kestos is a truly magical estate. This wonderful Sayulita vacation rental property sits at the point on the North end of the beach. Walk a few steps down and you are on the sandy beach right in front of the home. Quiet and secluded, the Casa Kestos Estate is truly the Gem of Sayulita vacation rentals. The estate consists of 4 bedrooms and 4.5 baths, and accommodates up to 14 guests in beds and a few more with aerobeds. 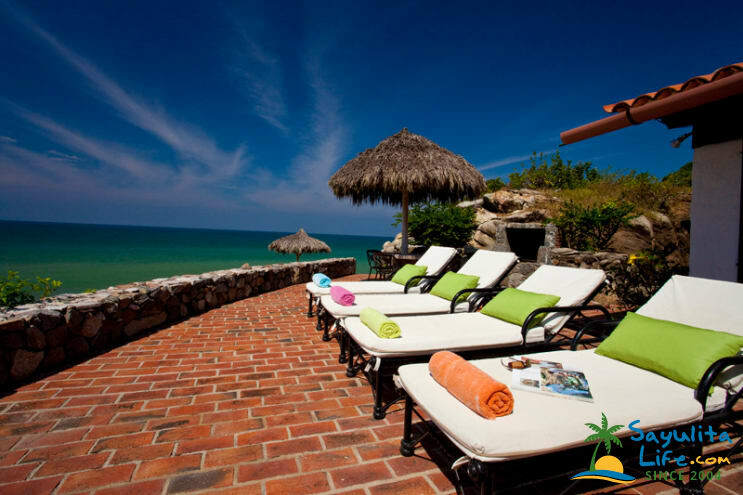 Casa Kestos Estate offers you what Riviera Nayarit and Sayulita are famous for: sweeping beaches of glistening sand, kissed by waves that never drop below 70 degrees F (21 degrees C), and thriving jungles of palms, vines, and vibrantly colored flowers. Perched above the beach, the edge of the infinity swimming pool merges with the horizon, past the diving pelicans and local fishing boats, beyond the breaching whales and dolphins, where the impossibly blue sky and the cerulean ocean meet. To the south, the beach hooks around to the excellent restaurants and other amenities in the traditional fishing village of Sayulita: close enough to walk to, far enough to forget about if you prefer your time more private and personal. Wake to the sound of rolling waves, whispering palms, and tropical birds. Go to sleep caressed by a gentle breeze perfumed by sea and jungle. What you do between is up to you. Please use the contact form to get in touch, by email or telephone with any questions and to arrange your stay. Please see the Pricing tab for further details regarding rates and fees. A gorgeously decorated comfortable “home away from home”. The staff is very attentive. Several days we walked into Sayulita an it is a bit of a hike but good exercise. The view cannot be better. Staying here was amazing experience! Hospitality was great, the house was perfectly situated on the beach with exclusivity and privacy and close enough to walk to town. The trip was amazing and Jeffrey and his team did a great job putting everything together and making sure my family had the best experience. I would definitely stay here again and recommend staying here to others. The beach is amazing and mostly private. Amazing place. Everything about this rental makes it a perfect paradise. Walk to town, yet far away to feel like you are on your own private beach. The Casa Kestos team are willing to help make it a perfect holiday. Property is amazing! Thank you so much! I took my family members to Sayulita and found Jeffery's house on SayulitaLife. From the pictures, the house looked great. And when we arrived there, the house looks just like the photos but even better. Very quiet and private, it has everything we need for a long weekend. I'm so very glad I chose this house. The communication with the host went very smoothly. The assistant Sara and house manager Ingrid are both very helpful. I will recommend this place to my friends. Hope we will be back again soon! I took 8 of my family members to Sayulita and found Jeffery's house. From the pictures, the house looked great. And when we arrived there, the house looks just like the photos and it's amazing. Very quiet and private, it has everything we need for a long weekend. I'm glad I chose this house. The communication with the owner and manager went very smoothly. The assistant Sara and house manager Ingrid are both very helpful. I will definitely recommend this place to my friends. Hope we will be back again soon. Great house secluded right on the beach! Casa Kestos was an excellent vacation home. Eight of us went down for a week and enjoyed every minute. The main house has two bedrooms and a small pool. We also rented the bungalow right next door and next to that the casita. Each room has a safe and keys to secure. It has a stone barbeque on the patio. The house staff was so helpful for all of our needs. Liliana made us dinner one of the nights and it was delicious. They provide water and clean the house every day. We even used the laundry service. There was a short 30 minute beach walk into town where you could go eat, and drink. The food is not expensive in town. We are definately going back! I really can't say enough good things about our experience at this property. There were nine in our group, and we are already planning our return! The house was clean and beautifully decorated, the staff was friendly and super responsive, and the view was absolutely stunning. Getting to the town center was a breeze, just a short and beautiful walk on the beach. I suggest making prior accommodations for transportation back if you're staying out late and don't want to walk, as we found it difficult to grab a late-night cab home. The great news is, the staff will gladly assist with that with enough advance notice! I also suggest you take the staff up on one of their home-cooked meals while your at it. This was a truly lovely experience and I highly recommend this property! If you are thinking about renting this property, go for it! There were 8 of us staying in the main house and casita. Make sure to double confirm what units you are reserving as there was some slight confusion when we rented, thinking it was the whole property that slept 14 but really did not include the bungalow since someone else booked at the exact same time on another site. Luckily it all worked out great. The house itself is well kept and has a great team of housekeepers and a house manager so everything runs as smooth as if you are on a hotel property. It is important to note that you will not be alone every day, but there is a team of people around to take care of the house and turn to if you need it. Liliana has a menu of breakfast, lunch or dinner for a reasonable per person charge that was a life saver on arrival and on New Years Day when suffering from a post NYE hangover. It was also amazing when we were joking about climbing a tree to get a coconut and make a drink and within 15 minutes she arranged to bring 6 down for the tree and someone to chop them open and give us straws to drink them with! We spend NYE at Don Pedro's where there was a 3 course lobster dinner, champagne, fireworks and a band on the sand. It was over the top! We all lit lanterns and sent them into the sky at midnight as icing on the cake. The house is by itself on a secluded part of the beach about a 30 minute walk from town along the beach. It is full gorgeous jungle! Although quiet as it's a bit of a distance from town, there are a lot of looky-loos who will walk near the house and hangout just in front of the beach patio taking selfies all day as its a bit of a destination point on the beach. There is a small gate to keep them at bay and actually they are quite entertaining to watch :) We also noticed some campers in the forrest nearby so at night or when you are not in the casita or bungalow i recommend keeping doors locked just as a precaution. You will receive lots of amazing and helpful information before your trip, of contacts, location, transportation, grocery service so the house is stocked and recommendations for town. Very organized, thorough and detailed. You will have everything you need and will be in direct communication with people to help prior to your arrival. I do not believe the house had cable as we tried to watch tv to no avail, but the wifi worked great 90% of the time between all of us. Every one of us considered it an epic trip and that is thanks to a great layout to accommodate people in-room or in common areas to sleep. Casa Kestos boasts a spectacular spot at the end of the beach. Every time I'm here, it's magic. The property sits right on the beach and there are very few other people around. It's an easy 20 minute walk down the beach to the center of town. We now use a dynamic pricing model. Our prices displayed are approximate rates only. Please use the contact form to email or call for a firm quote. Inquire about renting the main house, bungalow and casita separately. High and low season 4 night minimum, holiday season 7 night minimum. Additional charges apply for guests over the number stated above. Additional charges apply for stays of 4 nights or less. HOLIDAY SEASON - Christmas, New Years, Easter and Thanksgiving. We have another beautiful property, the Casa Los Arcos Estate. I have been renting vacation rental homes in Mexico and Florida since 1999. Today I rent about 45 properties, mostly in Puerto Vallarta, Sayulita and Fort Lauderdale/Wilton Manors. I own about 18 of the homes, some by myself and some with a business partner. Although I am an agent, I have a close connection to all of those who's homes I rent. In many cases, I designed the interiors for the property, and then took over rentals and management. All of our properties are self contained living spaces with no interior spaces shared with others. Some of the garden and pool areas are shared. In both Mexico and the US we have full time staff to make sure your stay goes smoothly. So if you are looking for a great vacation in Puerto Vallarta or Fort Lauderdale/Wilton Manors, give us a try.